I have learned so much from my teacher colleagues about the importance of Multiple Groups problems with a unit fraction in each group. If you’ve read Extending Children’s Mathematics and/or attended our CGI 3-6 or ECM professional development sessions, you know that Multiple Groups problems are Multiplication and Division problems with a whole number of groups and a fraction in each group. Unit fraction are fractions with 1 in the denominator such as ½, 1/10 or 1/3. Let’s look at a lesson that Christi Schrauger, an instructional specialist in Springdale, Arkansas, taught to a group of 4th graders this month. In previous lessons, the students solved a variety of Equal Sharing problems which gave them an understanding of fractional quantities, how to name fractions and how to write fractions in the a/b form. Mrs. Pekel has 7 boxes. Each box has ¼ of a pound of chocolate in it. How many pounds of chocolate does Mrs. Pekel have in all? Before describing her strategy, Magda said, “I solved the problem a lot like Ahymer, but I didn’t use a picture.” After Magda described each equation, Mrs. Schrauger asked her to pause so that the class could discuss what she wrote. When discussing each equation, other students linked Magda’s notation to the story in the problem, the representation of Ahymer’s strategy, and the ideas that 4 groups of 1 fourth is 1 whole and 3 groups of ¼ is ¾.
Carrie has 10 bags. Each bag has 1/3 pounds of chocolate in it. How much chocolate does Carrie have? The students again solved the problem independently before discussing some of their strategies in a whole class setting. Mrs. Schrauger noticed that a few students who used Direct Modeling to solve the first problem used Relational Thinking to solve the second problem. Teachers report that students move to Relational Thinking strategies quicker with Multiple Groups problems with a unit fraction in each group than they do with the same problems with a non-unit fraction in each group.For example, students who used Relational Thinking on this problem might use Direct Modeling if given a problem about 10 groups of 2/3. 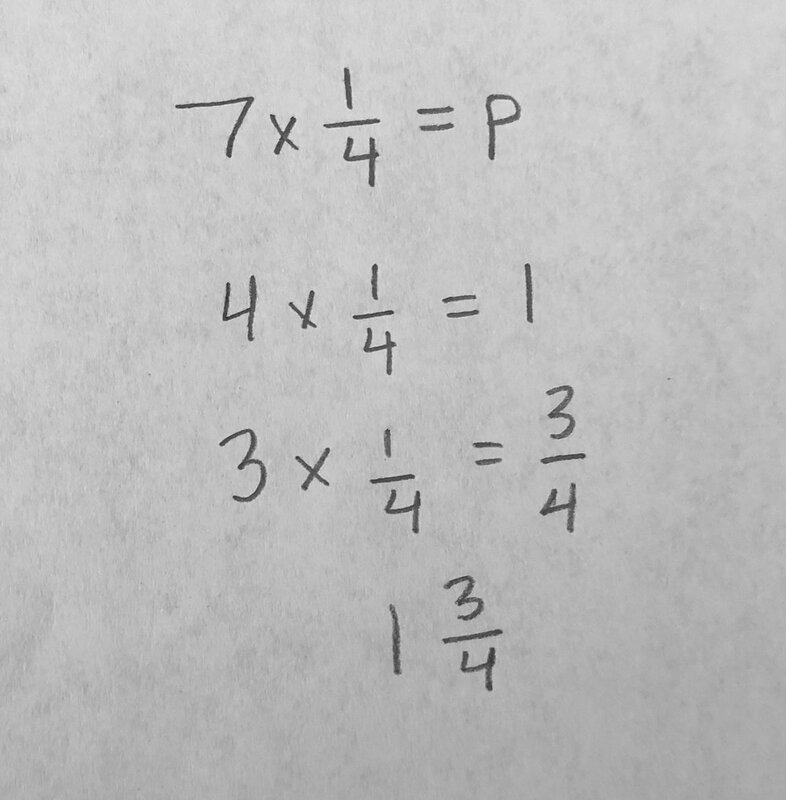 She also noticed that some students who had only the answer of 7 fourths for the first problem, expressed their answer to the second problem as both 10 thirds and 3 ⅓. Teachers also report that students are more likely to be able to express a fractional quantity in a variety of correct forms when solving Multiple Groups problems with a unit fraction in each group compared to Multiple Groups problems with a non-unit fraction in each group. For example, the same students who could express the answer to this problem as 3 1/3 might express the answer to a problem about 10 groups of 2/3 as only 20 thirds. Although there was no formal presentation of fraction concepts, these students engaged with a variety of grade level standards when solving these problems including b x 1/b = 1; a x 1/b = a/b and 1 divided by b is 1/b (b can’t equal 0 for all of these equations). They engaged with these standards by using their own intuitive strategies for solving problems and discussing their classmates’ strategies. Different students engaged with these standards at different levels of abstraction in that some students used a picture to support their understanding and others used only symbols. Mrs. Schrauger provided differentiation by supporting students to use their own strategies to solve the problems. Linda has 3 chocolate bars. If she eats ¼ of a chocolate bar a day, how many days will it take her to eat all 3 chocolate bars? Multiple Groups problems with a unit fraction in each group support students to move to Relational Thinking strategies and engage students with your State Math Standards. In a future blog post, I will describe how early exposure to Multiple Groups problems with a unit fraction in each group influences students’ strategies for solving Multiple Groups problems with a non-unit fraction in each group. You can learn more about Multiple Groups problems by reading Extending Children’s Mathematics.